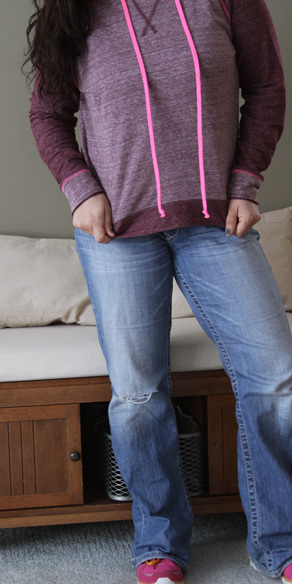 This week’s What I Wore Wednesday post really runs the gamete of this stay at home Mom’s wardrobe. From cocktail attire for a formal dinner to a day at home cleaning and cooking, there is a little bit of everything. A great Pinterest inspired outfit on a budget and even a Formal outfit for less than $75. Get the low down on why I am including What I Wore Wednesday posts here, but the main reason is to motivate myself to put in a little extra effort each and every day. What I wore Wednesday is a way for Mom’s to share outfits and get inspired to get dressed even if they aren’t heading off to work each day. The Pleated Poppy has an amazing series where she shares what she wears each week to keep herself accountable for getting out of her pajamas everyday and I’m joining in the fun! I hope you enjoy this edition of What I Wore Wedneday and get some good inspiration too. We will start with the more formal outfit, because well, that just doesn’t happen very often. My husband and I attended a benefit for our Local Boy’s and Girl’s club this past weekend and had a great time. I budgeted myself $100 for my entire outfit and needed something that would fit into the category of “cocktail attire”, but also be something that I would actually wear again. I very rarely go out to get an outfit for a special occasion, but for this one I did. I rose to the challenge and came in at $70 for the entire outfit including shoes and jewelry. I think I came up with the perfect outfit that was comfortable, sophisticated, but still fun. I also loved the idea of a long sleeved lace dress because it is still crazy cold here in Wisconsin. Maurices had a fantastic sale going – if you spent $75.00 you got $25.00 off. I was able to get the shoes, belt, and statement necklace for $50 to really dress up my neutral colored dress. I definitely loved the pop of green, and was so appropriate for St. Patrick’s day weekend. The necklace and shoes really made the outfit, and I will be wearing them over and over again with the other things in my wardrobe. Pieces that do double duty are always a plus for me! I debated adding hot pink accessories instead of green, but the green was a little more sophisticated, I thought. I thought the color scheme was perfect with my dark hair, and I did a quick easy side up-do for the benefit. I used hot rollers to add volume and soft curls to my hair and then put it all up. I start my teasing and adding more volume on top and then pin the sides of my hair back. I then do a side pony tail and leave out a small section from the opposite side of my head. I flip the ponytail into a messy bun, then neatly pin pieces around the ponytail holder to cover it. I then use the last (left out) section of hair to wrap it around the bun, and finish of the up do. It hides all of the pins and leaves just the right amount of hair cascading down. The next outfit was one of my favorites from the last couple weeks. 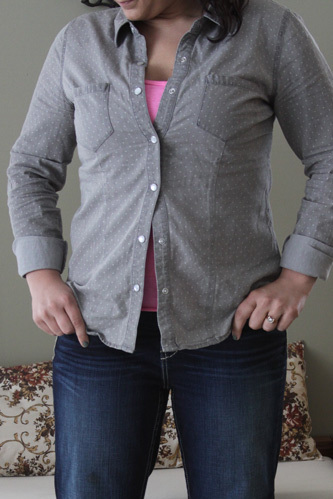 A hot pink shirt toned down with a polka dot printed gray button down shirt. This was one of my favorite Pinterest inspired outfits from this winter which came from homeybee20 on Polyvore. An adorable casual outfit but way to pricey for me at $145 (that’s minus the over $400 bag). Because my shoes were a gift my outfit came in at just under $36.00! I found a great shirt with the same lace detailing as my inspiration picture at our local K-mart for cheap and it is one of my favorites! And then we move to the ever comfortable more realistic version of my stay at home mom gear. The perfect mix of comfort and color to spend the day at home with the kids cooking and cleaning. Your cocktail attire is so lovely! I would love to wear something like that on a date with my husband.